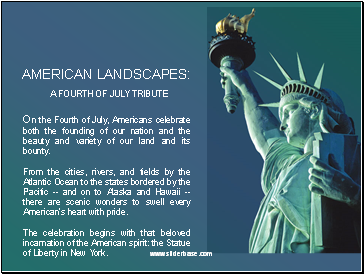 On the Fourth of July, Americans celebrate both the founding of our nation and the beauty and variety of our land and its bounty. From the cities, rivers, and fields by the Atlantic Ocean to the states bordered by the Pacific -- and on to Alaska and Hawaii -- there are scenic wonders to swell every American’s heart with pride. 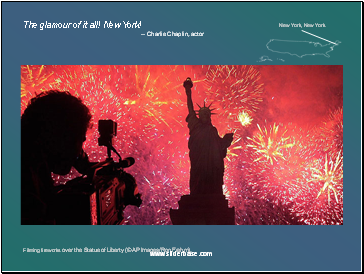 The celebration begins with that beloved incarnation of the American spirit: the Statue of Liberty in New York. The glamour of it all! New York! Filming fireworks over the Statue of Liberty (© AP Images/Ron Frehm). 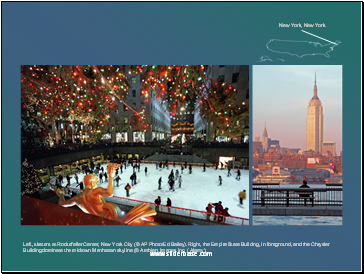 Left, skaters at Rockefeller Center, New York City (© AP Photo/Ed Bailey). Right, the Empire State Building, in foreground, and the Chrysler Building dominate the midtown Manhattan skyline (© Ambient Images Inc. / Alamy). 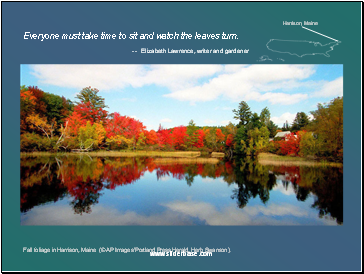 Fall foliage in Harrison, Maine (© AP Images/Portland Press Herald, Herb Swanson). 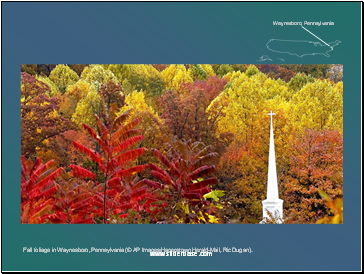 Fall foliage in Waynesboro, Pennsylvania (© AP Images/Hagerstown Herald-Mail, Ric Dugan). 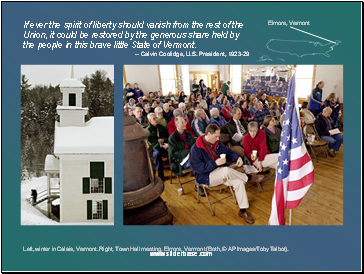 If ever the spirit of liberty should vanish from the rest of the Union, it could be restored by the generous share held by the people in this brave little State of Vermont. Left, winter in Calais, Vermont. Right, Town Hall meeting, Elmore, Vermont (Both, © AP Images/Toby Talbot). The freedom and happiness of man . [are] the sole objects of all legitimate government. Left, baseball Opening Day ceremonies, Washington, D.C. (Photo by Tim Brown). 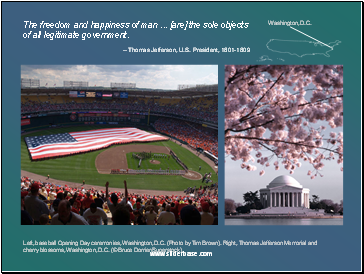 Right, Thomas Jefferson Memorial and cherry blossoms, Washington, D.C. (© Bruce Dorrier/Superstock). "I'm going back to dignity and grace. 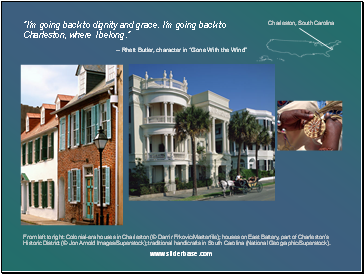 I'm going back to Charleston, where I belong."